Sydney, a city with extraordinary landmarks and lots of fun activities, is the top city-destination of Australia. The Harbour Bridge, the Opera House and the Sydney Tower are just a few of the city's many points of interest a tourist should check out. To do so in an efficient, time- and money-saving fashion, consider purchasing bus sightseeing tours with a complementary Sydney Harbour experience. Free Wi-Fi and audio commentaries are available on board buses. As for the other part of these packages, you need to think whether you need relaxation or the adrenaline rush. While the Sydney Hop on hop off Combo adds a cruise of the Sydney Harbour, the Sydney Big Bus Tours. 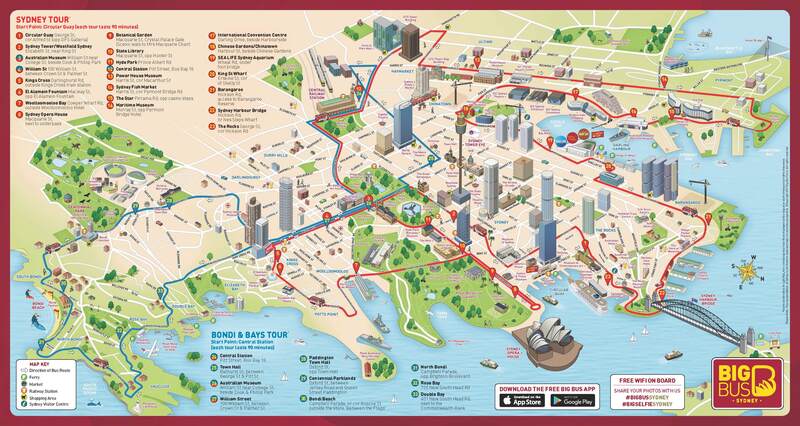 Both bus tours have 31 stops in total while the cruise line has 8 stops on both banks of the Sydney Harbour. The City and Bondi bus lines both have 31 conveniently deployed stops near top city attractions. Other information You can take a cruise first; once you do so, you can use your bus sightseeing ticket within 7 days. Where to Buy Sydney Explorer Hop-on Hop-off Bus + Harbor Cruise? We are comparing the Best Hop On Hop Off Sydney City Sightseeing tour Prices from leading online Tours and Ticket suppliers, try to find you cheap tickets prices on the market. Where to Buy Big Bus Sydney and Bondi Bus Tour Tickets? City sightseeing by 2 bus lines. Over 30 bus stops along both routes. Audio commentary about the city available in English, French, Spanish, German, Italian, Chinese, Japanese and Korean. Complimentary Wi-Fi on board every bus. Tickets valid for 1 day. Bus stops next to the top attractions of Sydney, including the Sydney Opera, Sydney Tower, Harbour Bridge and the Maritime Museum. Bus departures in short intervals, up to 20 minutes. Buses aren t suitable for disabled people. We are comparing the Best Big Bus Sydney And Bondi Bus Tour Prices from leading online Tours and Ticket suppliers, try to find you cheap tickets prices on the market. Bus stops: Circular Quai, Sydney Tower/Westfield Sydney, Australian Museum, William Street, Kings Cross, El Alamein Fountain, Wooloomooloo Bay, Sydney Opera House, Botanical Gardens, State Library, Hyde Park, Central Station, Power House Museum, Sydney Fish Market, The Star, Maritime Museum, International Convention Centre, Chinese Gardens/Chinatown, Sea Life Sydney Aquarium, King St Wharf, Barangaroo, Sydney Harbour Bridge and the Rocks. Bus stops: Central Station, Town Hall, Australian Museum, William Street, Paddington Town Hall, Centennial Parklands, Bondi Beach, North Bondi, Rose Bay and Double Bay. TripAdvisor Reviews: According to reviews posted on TripAdvisor (718), the Big Bus Sydney and Bondi sightseeing service is the experience that deserves the average rate of 3.5. The percentage of completely satisfied customers is 25% while very satisfied customers participate with 35%. The number of displeased users is around 20%. We were in Sydney for just 2 and a half days and the 48 hour pass was excellent value. In the warmer weather it s worth catching the 1st bus at 8:30am so you can sit on top without the heat being oppressive. We did the entire route to get orientated (takes about 1 and a half hours) and then used it more selectively. The 2nd day we did the Bondi leg. You can see just about every part of Sydney worth seeing on the tour and it only costs the equivalent of 2 or 3 taxi rides. Beware though that traffic is an issue at certain times and it can be slow getting from point to point. One of the best city tour options I ve experienced. The Big Bus Sydney and Bondi Sightseeing Tour is ideal for discovering the city and getting quickly between the attractions. With frequent departures and well deployed stops along 2 routes, you will get around with ease and efficiency. The accompanying narrative in 8 widely-spoken languages offers insights into the history of Sydney and its points of interest. Also, you can share your experiences via complimentary Wi-Fi. The downside of the Big Bus Sydney and Bondi sightseeing service is the lack of spaces suitable for disabled people. Also, the high-adrenaline boat ride offers a unique (and wet) experience in the Sydney Harbour. Is the Sydney Big Bus Right for Me? The Sydney Big Bus Tour is ideal for first-time and repeated travelers to Sydney that need to acquaint themselves with the city and get around efficiently. The tour offers several convenient options. Organizing your sightseeing how it suits you best and gaining insights about the city are a few major benefits. Feeling the flow of adrenaline through your body during the jet boat ride is ideal for adventure hunters. The Sydney Explorer Bus Tour & Harbor Ferry is the great sightseeing service of Sydney by land and coast. It allows its users to organize the city sightseeing at the pace suitable for them. Whether you wish to discover Sydney or get quickly between the points of interest, Sydney Explorer Hop-On Hop-Off Bus + Harbor Cruise will interest you. With conveniently deployed stops, you can stop and continue the ride or the cruise whenever you wish. Getting around the city and the Sydney Harbor. 2 bus and 1 cruise line. A few dozen bus and 8 boat stops. Complimentary pre-recorded narrative in 8 languages - English, Spanish, French, Italian, German, Korean, Chinese and Japanese. Packages ideal for individuals and families. Frequent departures for all means of transport. Seeing the Sydney Tower, Opera House, Harbour Bridge, Bondi Beach and other top attractions by bus. Visiting the Taronga Zoo, Shark Island, Luna Park and several other points of interest by the cruiser. Tickets for 1 or 2 days. Start time: 9:30am (Darling Harbour) and 9:45am Circular Quai, and every 45 minutes onward. Stops: Darling Harbour, Circular Quai, Luna Park, Watsons Bay, Taronga Zoo, Fort Denison, Shark Island and Manly. TripAdvisor Reviews: Sydney Explorer sightseeing service features an average rate of 3 by around 300 reviewers on TripAdvisor. What is interesting about this provider are almost equal numbers of fully satisfied, fairly satisfied, somewhat displeased and fully displeased former users. Most complaints relate to long waiting times. Great inexpensive introduction to the area. The entire city and beach was driven through although only structures of historical or cultural interest are pointed out (in many languages through the provided brand new sealed headphones). Note, the bus does not stop unless someone is getting on or off. My bus ticket was valid for 24 hours from the first usage (a longer period is also available) and I could hop off and on as many times as I choose. For example, pass a place that looks good for shopping, dinning, or exploring hop off and spend as long as you want before catching the next bus (the buses travel a set circuit). The driver was forthcoming with information and very courteous! Viator Reviews: According to the average rate, people who booked this service via Viator are very satisfied with their experience. Over 200 reviewers rated the Explorer Bus Tours and Harbor Cruise with the 4.5 rate. Get Your Guide Reviews: Tourists that booked this Explorer Sightseeing service through Get Your Guide rated their satisfaction with the average rate of 4.2. Sydney Explorer Sightseeing offers convenient options of discovering the city and getting between points of interest without hassle. The company has ticket packages suitable for individuals and families with the validity period of one or two days. Departures are frequent. Albeit buses tend to run a bit late, such an occurrence in a big city is always a possibility. Vehicles have the audio narrative available in several languages and free Wi-Fi. With over 30 stops along 2 bus routes, you can adjust the tour entirely to your needs. 8 hop on hop off stops are available throughout the Sydney Harbour. The obvious downside of the Sydney Explorer Bus Tour & Harbor Cruise is the lack of buses suitable for people with special needs. Is the Sydney hop-on hop-off bus + cruise Right for Me? Explorer Bus Tours and Harbor Cruise service is ideal for first-time travelers and anyone who needs to get between top attractions in an efficient manner. 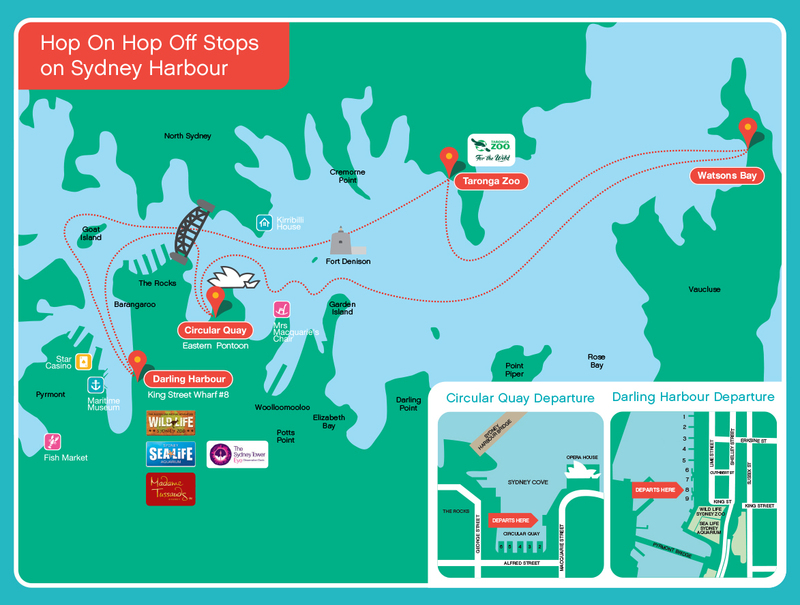 With the hop on hop off cruise available, you can visit the points of interest on both sides of the Sydney Harbour. Duration: 1 - 2 hours. © 2018 - 2019 Family Trip Advice. All rights reserved.